Wake In Fright, made in 1971 and now rediscovered and rereleased in the UK, tells the tense, stomach-churning tale of John (Gary Bond), a teacher tied to a remote outback school who dreams of better things. With a six week holiday to fill, he plans on visiting Sydney, but makes the fateful mistake of stopping for a night in a redneck outpost that seems to be almost exclusively inhabited by rough and ready, beer swilling men. Within a few hours, drunk and over-excited, John has gambled away all his money, and finds himself at the mercy of the town's inhabitants, whose seemingly open-handed hospitality is tinged with alcohol-fuelled menace. So far so Hostel meets The Proposition. 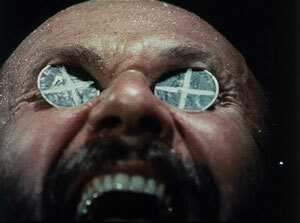 But in fact Wake In Fright is more like Lord of the Flies meets Arthur Machen's The Great God Pan, offering a terrifying vision of how quickly a seemingly-civilised man can descend into bestial cruelty, dragged down to the base level of those around him, torn between self-disgust and drunken exultation. On encountering Donald Pleasance's Doc, an Aleister Crowley-esque figure in whom pragmatic self-awareness bridges hollow depths of nihilistic darkness, John finds himself adrift in a world of alcoholic excess, violent male camaraderie and flagrant disregard for any kind of social norm; a world that comes sharply into focus when his new companions take him (willingly!) on a kangaroo hunt – a real one, it transpires at the end of the film, and very distressing it is too.